I have found myself really challenged with this block! It is nearing completion in the round robin rotation and all the work already on it was so lovely - mostly really lovely silk ribbon florals done in gorgeous hand dyed ribbon. I could not manage any silk ribbon good enough not to stick out like a sore thumb so have decided instead to stay with the floral theme but to use another technique. So this is the first part of what I have done. Here I am again embroidering a plant I have never seen - or at least never seen in bloom except in pictures. It is an aloe vera. The inspiration for this motif came from the book, Ribbon Embroidery and Stumpwork, by Di van Niekerk. The first step was to make the three stems. I used beading wire for this and secured each piece in turn by pushing it through to the back of the block. I bent it back on itself and secured with several stab stitches, then bent it back on itself again and added more stab stitches. To cover the wires I used two strands of Weeks Dye Works cotton floss, brought it up through the fabric at the bottom of my wire and just wrapped it around and around until I had the length I wanted the stem. I secured the end of the wire the same way as I did at the beginning except left it on the front because the bullions would cover it. If I did this again I would take it to the back because the end of the wire keeps wanting to peek through the bullions. I made the wire a little longer than it needed to be for the distance so it would have some dimension. Next step was the blossoms. I used three colours of Gloriana Princess Perle Petitle silk thread in progression, starting at the bottom making bullion knots of random length, covering the end of the wire of the stem and then working up to a point, each layer of bullions overlapping the last. More fun then with the leaves! They were mostly open picot stitch with a couple at the front being closed picot stitch so some of the front leaves would have a nice point at the bottom. For these I used House of Embroidery Perle Thread No. 8. It is a 100% cotton thread, hand-dyed in South Africa, that I received as a gift. Such a wonderful thread to work with! Most of the leaves were left free at the top but a few I secured to the fabric with a tiny stitch or two to shape them as I wanted. I wanted to have a few bending over. The last step were a few french knots and little straight stitches for a suggestion of the earth under the plant, again using the same thread as the leaves in another colour. Hope this explanation helps someone! This lovely puzzle piece arrived in the mail this week from Pat Winter, along with some lovely goodies I will put to use very soon in my stitching. I think this puzzle piece is adorable! Pat does such lovely stitching - it is a real pleasure to have a piece of her work now. Thanks Pat! I came across more initial hankies at the thrift store, another box of three, with the initial "E" this time. I am popping one in the mail to my friend, Leslie E., and the other two are up for grabs. I love the embroidery on these ones and think they would make a lovely addition to a piece of crazy quilting. So, if your first or last name starts with "E", or if you have someone special in your life with an initial "E" that you would like to make a project for using one of these hankies, leave a comment on this post. The first two comments will receive the hankies. ... or baby rattles! See, the possibilities really are endless! Now that I hope I have you inspired with ideas, here is the scoop on this stitch. It is simply a glorified french knot! There is an excellent video tutorial on Mary Corbet's Needle'nThread blog in her Video Library of Stitches. Mary has also written very good information and tips in this post. You can also check out Sharon B's Dictionary of Stitches for a good written tutorial with very clear photos. There is a wonderful book in Country Bumpkin`s A - Z series, A - Z of Bullions. You can often find a sale on these books if you google the title. Most of the motifs I have shared above came from this book and I highly recommend it. While searching for information I found another book listed, Bullion Stitch Embroidery: From Roses to Wildflowers, written by Jenny Bradford. I have ordered a copy and am looking forward to seeing it when it arrives. I wonder if anyone already has a copy and can tell me if they recommend it? My last word on bullions is that you will save yourself a lot of headaches if you use a Milliner`s needle. These needles have no bulge in the shaft where the eye is so they pass through the stitch much easier. My friend, Ilys, came out for a few days to the campsite and worked on a baby quilt. This is one of the blocks (and Ilys!) The fabrics are all flannel and the prettiest colours! The centers are all these little animal characters that are fussy cut. The sashing that Ilys has planned is a white flannel with tiny mini-polkadots in multi-colours. I think this is going to be just adorable and I can't wait to see it finished! Jo in NZ is having a great giveaway on her blog to celebrate her 600th post. Check it out! While you are surfing around, Jo also has a couple wonderful Etsy shops that are worth taking a peek at: the first one is where you will find all Jo's crazy quilted and embellished functional art, and the second is "Vintage Vices", where you can find all sorts of vintage doilies, linens, etc to use in your own art. I decided that the vintage star sequins were a little too flat and uninteresting so I removed them and did it again. This time each one has a sequin, then a bead, another sequin and another bead. I think the added depth adds a bit more interest. This area of the block was bothering me that it was too bare and I had these great sequins I found recently and decided to make three sequin flowers here. These sequins are quite large - now I am starting to worry about how many larger size motifs I have on this block. Time to stop second guessing myself though - Debbie can tweak to her hearts content when the block gets home. A couple of my favourite regular campers, Ross and Lorna, came out for a visit this week. I was thrilled when Lorna brought some of her minatures to share with me - I have been anxious to see them. The rug above is needlepoint and was one of Lorna's first pieces she made. The afghan in the foreground of this picture is crocheted from a regular afghan pattern. It is only the thread and tool she uses that makes it this tiny! Can you believe how delicate it is!? This chair is my favourite piece! It is hard to believe but Lorna makes these from scratch, doing the woodwork, stitching and construction - she just wings it! The upholstery on the chair is done in petit point - 50 count! I think it is just beautiful! She constructs the doll from scratch, building the body and then the clothing after, including all the jewelry and accessories. I love the little cameo at her waist. You can't see it from the picture because of her full skirt but she is sitting on a rattan settee. Yes, Lorna made that too! She said she just had to try her hand at rattan and used string for the wicker. I wish I had got a picture of it because it is worth seeing! Somewhere in my sewing room I have a kit to make a wooden dollhouse and I have always had it in the back of my mind to put it together and then furnish it with minature stitching. I am definitely reinspired after seeing all these pieces. I am so happy that Lorna took the time to bring them out to the lake for me to see. Thanks Lorna! I have finished my work on Debbie's block for the Christmas Round Robin I am in. I have already posted the two waste canvas cross stitch motifs I have done. If you look closely you will see three of my BAS seams as well: the braid applied to the ribbon surrounding the silkie Debbie provided was one,under the deer is my Hedebo edging with beads, and the seam between the blue and burgundy patches is my sample of Sorbello stitch. I have been wanting to try the bullion stitch Christmas puddings from A - Z of Bullions for awhile now so this was my chance. They were a lot of fun to do! I have admired the lovely pine cones I have seen people stitch so I wanted to try one. I built an evergreen branch with stem stitch wood and needles and then built a cone with sequins and seed beads. I feel like I could keep stitching on this block for another couple weeks but I have to send it on sometime so I guess it is time to quit. I sincerely hope Debbie likes it! In the waste canvas tutorial in a previous post, I mentioned that fractional stitches could be accomplished but did not elaborate. Since I was doing just that this afternoon I thought I would take this opportunity to illustrate what I meant. The waste canvas is made up of pairs of threads. In most cases, you treat the pairs of thread as one thread as I have done using the silver metallic thread above. However, if you want to make half or quarter stitches, you can divide the pairs of thread to give you a middle space. If you click on the above picture, I hope it will be clearer and you can see that is what I have done with the stitches in the gold metallic threads above. Here is this motif finished after the waste canvas has been removed. It is one of several lovely blackwork motifs in The Cross Stitcher's Bible by Jane Greenoff. This week's stitch is the Sorbello stitch, an old stitch that originated in the village of Sorbello in Italy. It is closely related to the Palestrina Stitch that we used in Week 28. 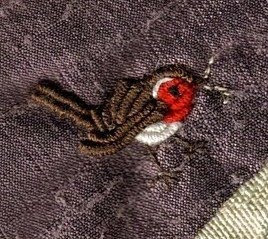 According to my research, Sorbello Stitch is a common stitch used in cross stitch, needlepoint and embroidery. I have to admit that it is a new one on me! There is a set of diagrams in Sharon B's Dictionary of Stitches which should be very helpful. 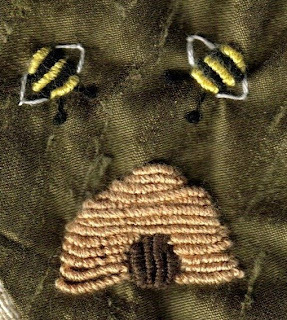 You can also read more about the use of this stitch in Embroidery Stitches by Mary Webb at Google Books - the photograph of the stitch in progress is especially good there. When you try this stitch keep in mind that it needs to be worked fairly loosely. A looser tension really allows the beauty of this stitch to shine through. It is a lovely stitch to do - simple yet effective - and a great rhythm develops as you are doing it. I hope you will give it a ry. Enjoy and have fun! First, the roses... This little blossom is the wild rose, which is incidentally the provincial flower for Alberta. It grows low to the ground and is very hardy - comes back year after year no matter how many times it gets mowed down. Smells gorgeous too. Now, the whine... It is "crunch time", the time that comes each year when I just want to go home so bad and would quit my job at the drop of a hat and leave the lake to go back to my home, sweet home. I am so homesick! DD, Katie, will be moving to the city the 26th of August so she will be gone before I even get home! It makes me so sad that she will be gone and that I am missing 0ut on all the fun of helping with the first apartment - picking towels and shower curtains, talking about how the furniture will be arranged, etc. 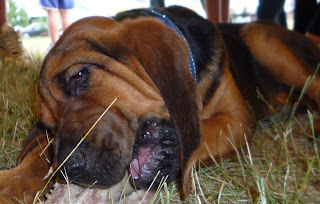 Duke, the bloodhound, is getting into all sorts of trouble because there is no one there all day - that would usually be me that would be there to keep him company and watch he doesn't get into mischief while everyone is at work. Just today he managed to chew up the last of the three phones he has demolished this week and topped it off by eating the remote controls for both the tv and the satellite system. DH is not amused. Lots of friction caused by this but, really, it is because the dog is lonely too - like me out here! Maybe I should chew up something... besides donuts. I want to jump in my truck and pop off to visit the kids and not have to worry about the 24/7 that the campground is each year. Enough whining I guess - anyone have some cheese to go with this whine? I keep taking pictures of the sky and the water... the water and the sky... Can't help myself since both are constantly changing! I love it when the sunshine comes down in rays through the clouds. I can't remember who told me these were "the fingers of God", but I have thought of it that way ever since. It seems so apt. I was preparing to put a small cross stitch motif on a crazy quilt block when I remembered I had promised to do a tutorial on doing this with waste canvas, so here it is. You need to find a small cross stitch pattern you like that will fit in the space you have and figure out how large a piece of waste canvas you will need. Most cross stitch charts are graphed into 10 X 10 squares like the ones above. Waste canvas looks like needlepoint canvas except a little lighter-weight and is marked off in 5 stitch divisions by the blue threads. It comes in several sizes, 14 count being the most common and what I am using here. The canvas has double threads between each hole but you treat them as one unless you are doing a quarter or three-quarter stitch - they come in handy then as you can put your needle between the double threads to make the half stitch. I allowed myself half an inch on all four sides beyond the outer edge of where the motif will reach. Center the waste canvas on the spot you want your motif and baste around the edges to hold it in place. Cross stitch the design from the chart as usual, except where you would usually be counting the threads in your linen or other cloth, you will be using the holes provided in the waste canvas much the same way you do with Aida cloth. One note I would make is that I use a sharp embroidery needle instead of a cross stitch or tapestry needle. The sharp needle will make it easier to needle through the underlying fabric of the block. Take care not to pierce the threads of the waste canvas with your needle. It will make it more difficult to remove the canvas threads later. Complete your cross stitch design, including any backstitching required and remove your basting thread. You can now start pulling out the threads of the waste canvas, starting on the outer edges and working in. The picture above shows the threads removed until the cross stitched area is reached. Some instructions tell you to moisten the waste canvas before pulling out your threads but I have not found this necessary and I am reluctant to try it in case the water spots the silks or other fabrics in the crazy quilt block. Continue pulling out the threads under the cross stitch design one at a time. This is where it is much easier if you have not pierced any of the threads of the canvas. I find it helpful to hold my thumb on the cross stitches as I pull out the threads. You can start to see your design more clearly as the canvas is removed. And here it is - my finished motif! I did cross stitch for years and years and sometimes it is nice to do a little again. Since I became obsessed with crazy quilting I have left cross stitch behind for the most part. Waste canvas can be used to do counted cross stitch on any fabric that is not evenweave. I have used it on socks, baby clothes and many other items. Sending out the "B" initialed hankies to Thelma and Lauri today - have fun with them! On the Christmas in July giveaway I am sending out the book to Skye today, thanks to the help of the random number generator. Hope you enjoy the book, Syke! The August long weekend is over and it was a mixed bag. The campground was very busy and that was good. The family came out to visit and give me a hand and that was the best part. It is always great to see the kids and the grandkids and to get to spend some time with them! The down side was the two nasty storms we had go through during the three days. Friday night we had a thunderstorm preceded by a wild wind storm. There were at least fifteen tents absolutely flattened! A lot of campers gave up on the weekend and went home then - likely a decision they are happy about now since we had an even nastier storm come through on Sunday night. Everyone was woken up at 3:15 a.m. by lots of thunder and sheet lightening. Then the hail hit. They were golf ball size or bigger and none of the trailers escaped damage. It was really scary in the middle of the night to wake up and find all the roof vents were smashed and we were all cold and wet with hail and water pouring in. The noise was incredible - it sounded like a freight train or like there was a dump truck pouring a load of gravel on the roof! Outside the windows was just a wall of grey - you couldn't see anything. I think we must have been very close to the edge of a tornado. Just down a bit from our campsite it looks like something touched down. There is a path where the grass is flattened and debris was swept along. The part I found most troubling were the birds. I have been enjoying my beloved swallows all summer - both those I have watched in the nest as well as the huge flocks that come out morning and night to do their astounding aerial acrobatics as they eat mosquitos. While surveying the damage of the storm near the path I mentioned we found two large trees where the swallows had been roosting. Under them and along the path were large numbers of dead and bloodied swallows. These poor birds - it just made me so sad to see them all. There were several ground squirrels among the victims of the storm too. It appears they were forced from their burrows to avoid drowning only to be beaten to death by the hail. The family all went home on Monday afternoon but one of the campers who had gone back to the city phoned my house to let them know that there was another severe thunderstorm and hail warning for last night. I was surprised last evening to find my darling daughter, Katie, on the doorstep of my trailer with dry blankets and pillows, announcing she was here for a sleepover! She had to get up at 4 am to leave for work but didn't want me to be alone out here with another bad storm. I was very happy she was here - everytime the thunder and lightening and rain woke me last night my first thought was that I was not alone because she was here. I know I am loved but sometimes it is such a good warm feeling to feel it surround you like that! Today the I will be working on the big cleanup to get things back to normal before next weekend when there is a big fishing tournament at the lake.